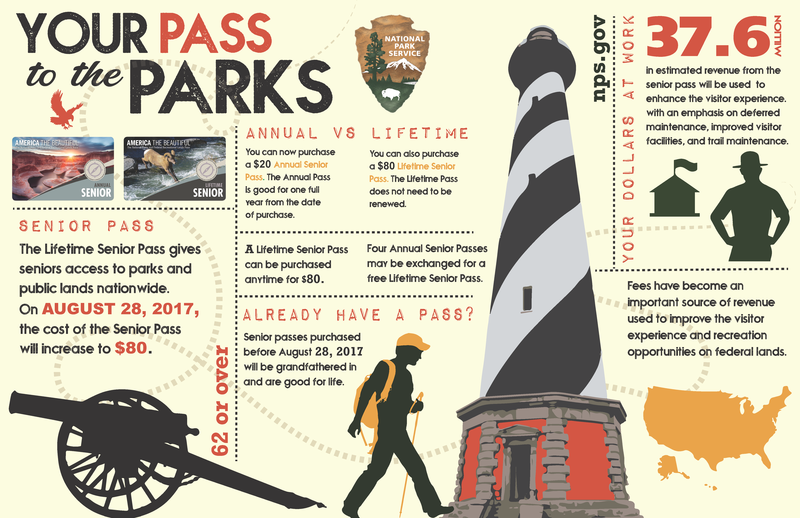 If you are 62 and over and frequently visit lands covered by the “America the Beautiful – The National Parks and Federal Recreational Lands Pass – Senior Pass” and you haven’t purchased your lifetime senior pass yet (or have lost yours and have been intending to replace it) BUY IT NOW!! The senior pass, which costs a one-time fee of only $10 for life once you turn 62 (and only $20 if you order it by mail and/or online) will be going up to $80 on August 28, 2017. If you already have your senior pass, it will be grandfathered in, and all it’s benefits remain intact for life (as long as it’s not lost or stolen) – you won’t have to pay more. Any new senior pass bought through August 27, 2017 will still cost the original $10. They are having a large volume of purchases at the moment, so passes may possibly end up being out of stock at actual physical sites at any one time, but the USGS purchase website says that any mail order purchases through the USGS that are *postmarked* before August 28th will still be honored at the $10 price. $10 is a great bargain to be able to get free access to a bountiful myriad of recreational sites within the BLM, Bureau of Reclamation, Fish & Wildlife Service, USDA Forest Service, National Park Service and US Army Corps of Engineers. Plus you often get discounts (sometimes up to 50%) on extra amenities within those agencies, such as campgrounds. To be honest, even the new price of $80 lifetime will still be a pretty darned spectacular bargain. Most birders could plow through that price in Day Use Fees alone, in very short order. The government is also implementing a brand new Annual Senior Pass for $20/year, for those on a budget, or those that aren’t yet sure if they’d use a pass that much. The nice thing is, after you’ve purchased four Annual Senior Passes in the future (a sure sign that you ARE using them much!) you can then trade in those four passes to obtain a life pass, which you can then use instead, with no further annual pass purchases needed. (So make sure you don’t throw any of the expired ones away! )And one very important recommendation: once you get (or already have) your lifetime Senior Pass in hand, treat it like gold!!! They are good for you to use for life, but if they are ever stolen or lost, you will have to buy a replacement, and that will be at the new $80 price. fyi – the web page is showing it takes 12 weeks to actually get the pass … so don’t fret if you apply and it doesn’t arrive for a bit of time.